It would not be an exaggeration to say that American cities in 1800 were awash in ignition sources. Flame in one form or another was everywhere: candles, fireplaces, heating stoves, cooking stoves, oil lanterns, foundries, smithies, and so on. Lanterns were carried into stables filled with hay. Homes and businesses were heated by combustion of wood or coal. Domestic lighting was provided by candles and oil lamps, and later by gas lamps, themselves an ignition source. Smoking was common, especially of cigars that would smolder long after being tossed away. By mid-century, steam-powered trains spewing sparks entered into the heart of cities. Stationary steam engines fired by wood and coal became common power sources in factories and machine shops. to have erected in the Heere Gracht (Canal) at the East River [at what is now Broad and Pearl Streets] a convenient and durable lock, to keep said Gracht at all times full of water, so that in time of need because of fire . . . and at other occasions it may be used and that especially the great and unbearable stench may be suppressed, which arises daily when the water runs out. The Great New York City Fire of 1776. Source: Wikipedia. But these regulations were not sufficient. The rapid growth of the city and necessity of using fire for daily living and working meant that conflagrations were a grave danger. One of New York’s worst conflagrations took place during the American Revolution. 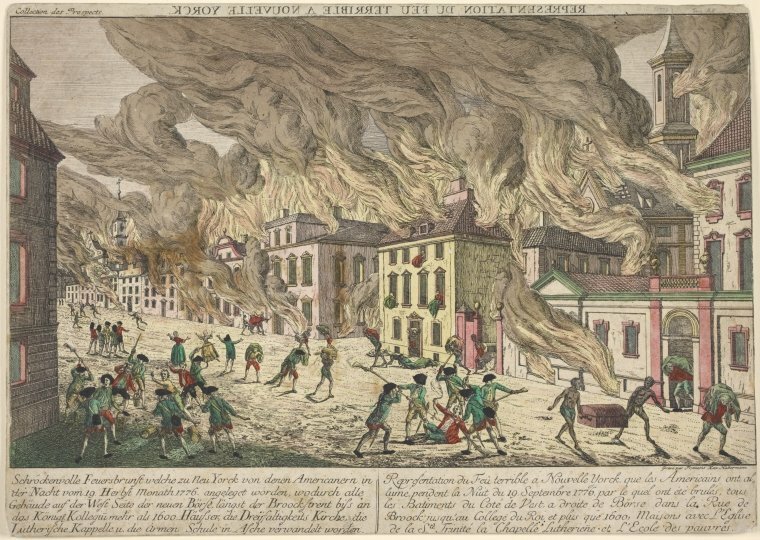 In 1776, patriots allegedly torched the city during the British Occupation, destroying about one-third of its buildings. Yet, after the Revolution, despite the fact that much of Gotham was a pile of ash, the city resumed its upward trajectory. Nonetheless, in 1835, New York’s second Great Fire ravaged 17 city blocks around the Wall Street area. And only a decade later in 1845, another conflagration, destroyed another 345 buildings. Each time rebuilding began immediately afterwards. One of the factors which contributed largely to the remarkable progress of architectural design and subsequent building construction was the great fire of 1871. This fire, in which 18,000 buildings valued at $192,000,000 were burned, wiped the slate clean, and served as a vivid warning that more permanent construction was required. To date no other city has had such a stimulus to improved building construction, together with industrial wealth sufficient to finance swift rebuilding. After the Chicago fire, many structures were quickly rebuilt, but the financial panic of 1873 slowed reconstruction for a period of nearly ten years. Then there came a golden decade of building which culminated in the World’s Columbian Exposition. Another relatively quiet period followed the panic of 1893, but by the turn of the century the most important developments had been realized. Skeleton construction, structural steel, and caissons had been proved and accepted, and reinforced concrete was on its way to acceptance. The materials and methods of construction had been devised, and engineers and architects were in a position to meet all demands then current for height of construction. Luck, combined with expertise and grit, enabled inquiring minds to solve the problems at hand. Randall recounts an anecdote about the architect John Van Osdel. As the Great Fire approached his office, he scooped up his plans and ran to the basement. There he dug a pit and threw in the documents. He filled in the hole with two feet of sand and capped it with a thick layer of damp clay. His records survived unscathed, and from that experience, he developed the idea of using clay tiles to help fireproof buildings. As Sara Wermiel demonstrates in her book, The Fireproof Building, the collective search for the incombustible structure was driven by insurance companies, engineers, developers, and the business community. Because of economic growth and competition, Chicago builders had a sense of urgency to make sure they were using the latest technologies. Out of the communal process of trial and error, the skyscraper was born. Even though massive fires were a major problem, they did not stop great cities from being great. They demonstrate that, in some sense, the Metropolis is an idea, and as long as that idea is persevered, rebuilding is never out of the question. Conflagrations, generally speaking, were generational in frequency. Though the fear of them might have been ever-present, their actual manifestations were, statistically speaking, rare; rare enough that when they occurred, they engendered massive rebuilding to preserve, and improve upon, what had already been built. A city, once “ignited” by economic growth, then creates the expectation of future growth, which, in turn, becomes a self-fulfilling prophesy. The belief in growth is as important as the growth itself. To paraphrase the economist, Homer Hoyt, Chicago was a city in spirit long before it was a city in fact. For two centuries European explorers dreamed of converting the “dismal swamp” into a key transportation node, connecting the Eastern Seaboard to the Mississippi River. Once the decision in the 1820s was made to build a canal connecting Lake Michigan to the Illinois River, the city’s growth was assured. It was not long before Chicagoans were claiming that the destruction of the downtown had done more good than harm. Be clearing away the old wooden building stock, the catastrophe enabled businesses to erect new structures using the latest techniques for fire prevention….More important, the burn produced a construction boom that drove up the price of downtown real estate. Left: Map of Boston showing the area around the Great Fire of 1871, digitized by Hornbeck and Keniston (2017). Right: Digitized map of border area burned by the 1906 conflagration in San Francisco as produced by Siodla (2015). Recent research, using modern economic and statistical methods, is able provide evidence if there were, in fact, unintended benefits to urban conflagrations. The first step begins by creating a digitized map and a data set about not only the burned areas, but also the areas just outside. The seemingly random start of a fire and the seemingly random direction it takes allow for a comparison of the “treatment group” (the burned area) with the “control group,” the area adjacent that was not burned, in order to compare the effects after the conflagration. On November 9, 1872, a fire broke out in a warehouse on Summer Street in Boston. Twelve hours later it was finally contained, but, before that, it destroyed about 776 buildings across 65 acres, including much of the financial district. In their paper, “Creative Destruction: Barriers to Urban Growth and the Great Boston Fire of 1872,” economists Richard Hornbeck and Daniel Keniston investigate the evolution of land values inside and just outside the burned area for several years before and after the fire. Land prices measure the value of geography itself. If values rise after a fire, it suggests a renewed confidence in the neighborhood and the city itself. If they fall, it suggests the opposite. We estimate that the Fire generated substantial economic gains, capitalized in higher land values. Land values increased substantially in the burned area, and by a similar magnitude in nearby unburned areas, with the estimated impact declining in distance to the Fire boundary until leveling off at around 1,339 feet (25–30 buildings away). If we assume the Fire had no impact beyond 1,339 feet, the implied total increase in land value is comparable to the total value of buildings burned in the Fire. They find that the destruction allowed landowners to rebuild the neighborhood essentially all at once with modern buildings that reflected the latest technology, and were better suited to the needs of the residents. This likely had the effect of increasing the population and business density, as the new buildings were able to accommodate more people, which, in turn, made the geography more valuable. Just as importantly, landowners whose buildings did not burn obtained an indirect benefit from the rebuilding efforts inside the burned zone. The reconstruction efforts made the neighborhood as a whole more valuable because the structures were now of both a greater quality and quantity. Rising land values likely drove landowners outside of the burned area to tear down their older buildings and go along with the modernization wave. On April 18, 1906, at 5:12 a.m. a magnitude 7.9 earthquake struck the coast of Northern California. San Francisco was badly hit, and it triggered a conflagration, destroying more than 28,000 buildings. Ironically, the vast majority of the city’s destruction came not from the earthquake itself but from the fires it triggered. A research paper entitled, “Razing San Francisco: The 1906 Disaster as a Natural Experiment,” by James Siodla, looks at the effects of the conflagration in San Francisco. In particular, he focuses on residential population density before and after the fire. Using a similar statistical approach as that of Hornbeck and Keniston, Siodla compares population density growth within the burned area to just outside. He finds that it went up in both the burned and non-burned areas, but the burned areas saw a much steeper rise. In other words, the rebuilding allowed for landowners to construct modern apartment buildings to cater to the demand to live and work in San Francisco. This rise in population density in the burned areas persists today, and so those neighborhoods continue to have a better ability to accommodate people who want to live in the city. What Does this Research Suggest about Cities Today? As the research above demonstrates, a silver lining to the conflagrations was the ability to rebuild large parts of the central city nearly all at once. In other words, the fires released some “frictions” that were holding owners back from updating the building stock, where frictions mean some additional cost or hurdle that prevents landowners from changing the use and quality to that which best accommodates the demand. It is also important to point out that the rebuilding efforts discussed above happened before the implementation of comprehensive zoning and land use regulations, which were not adopted in American cities until after 1915, following New York City’s lead in 1916. Thus the reconstruction efforts in the late 19th and early 20th centuries were based on the decisions of individual property owners. A key point is that even in a city without zoning or land use regulations (or NIMYBism), there are strong incentives preventing a city from modernizing itself. Zoning and NIMBYism add an additional layer of frictions to the real estate market. As the world around a city changes, if the city itself is inhibited from changing with it, society is worse off. First, in a growing city, if supply cannot match demand, housing becomes much more expensive. This also exacerbates income inequality, since the owners of land are given a kind of monopoly power over renters. Second, it also reduces economic growth. Buildings need to adjust to accommodate the changing nature of work and the changing lifestyles of city dwellers. Converting loft buildings to condos will only get a city so far; while allowing carbon spewing single family houses to use up a majority of a city’s land acts a bottleneck to a better quality of life for its residents more broadly. And, finally, redevelopment hurdles prevent people who would like to move into the city from doing so, because they cannot be accommodated (and this also limits the spillover benefits from urban density). To be clear, it’s important to find the right balance between modernization and preserving a city’s architecture and feel. But in this day and age, the suite of (often well-intentioned) government-imposed limitations only serves to add more barriers to a market that has them to begin with. This is like pouring liquid nitrogen onto an ice cube. Ironically, though Chicago was the first city to build a skyscraper, it retained a “fear of heights” from the Great Fire. In 1893, the city capped the heights of its buildings at 130 feet. 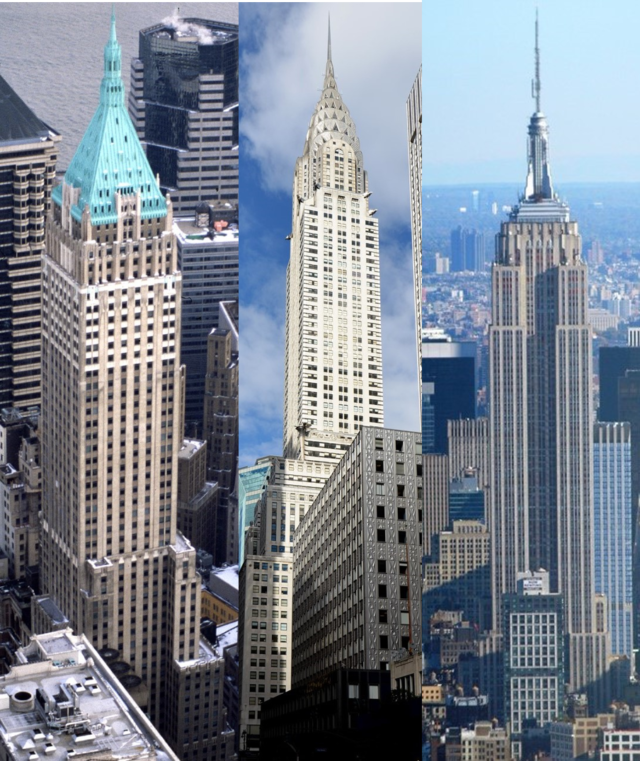 While over the decades, the height cap moved up and down, they served to help New York take over the skyscraper leadership. Why Was 2017 Another Record-Breaking Year for Skyscrapers? Implicit in these statements is that something is not quite right; that the world is being flooded with supertall structures must be due to nefarious, decadent, or irrational objectives. But, the truth, alas, is quite mundane. The increase in supertalls is a direct response to global economic growth. This fact holds as true today, in the early 21st century, as it did a century ago. If we take a step back and look at the long history of skyscrapers, we can get a better perspective on when and where they are constructed. The first skyscrapers were built in Chicago and New York City starting in late-1880s as a way to accommodate the demand for office space in their respective central business districts. The skyscraper was invented as a “machine that makes the land pay.” That is to say, land prices in New York and Chicago were so high at the time that developers aimed to build taller structures as a way to recoup the expense of paying for the land. However, the reason that land values were so high was that the Loop and Wall Street were booming at the end of the 19th century. These two cities were growing rapidly to accommodate the increasing trade and commerce that were contributing to America’s wealth. Once a city or nation achieves an economic threshold, it then has the resources and economic demand to build a skyscraper. Technological progress over time makes the definition of “tall” creep up, but the logic of tall has not changed. It emerges from the supply and demand calculus. Increasing business, trade, and urbanization draw people to cities. Because of the strong forces of agglomeration, some locations become very valuable. This then incentivizes developers to build tall, which further increases the value of these central locations, increasing demand for more skyscrapers. We can see this in America in the early 20th century. Figure 1 shows, for 72 cities, large and small–from Albany to Youngstown–the relationship between a city’s population and the number of tall buildings it hads. 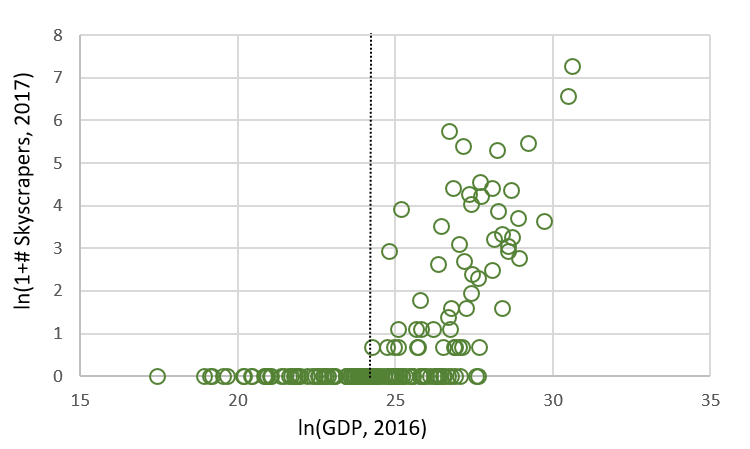 The left graph shows the number of structures that are 10 stories or taller in 1929 versus its 1920 population; the right graph shows the number of 21-story or taller structures versus its 1920 population (all variables are in natural log format). Number of tall buildings in 72 U.S. cities in 1929 versus their 1920 populations. Sources: Number of taller buildings is from Weiss, M. A. (1992). “Skyscraper Zoning: New York’s Pioneering Role.” Journal of the American Planning Association, 58(2). Population data is from Gibson, C. (1998). “Population of the 100 Largest Cities and Other Urban Places in The United States: 1790 TO 1990,” or from a respective city’s Wikipedia entry. While the relationships are not one-to-one, it is clear that larger, more productive cities have more tallr buildings (the same would be shown with each city’s gross city product, but I could not find such data). On average a 10% increase in population lead to having an 8.6% increase in the number of 10-story or taller buildings. Furthermore, a 10% increase in population increased the probability of having a 21-story or taller structure by 2.5 percentage points. Once a city’s population hit about 315,000 there was a 100% chance it had at least one very tall structure (except for Washington DC, which had strict building height laws). That was nearly a century ago. Let us scale this up to nations today. Barely any poor countries have skyscrapers. North Korea, which has been trying to finish the Ryugyong Hotel since the late 1980s, stands as a monument to the exception that proves the rule. 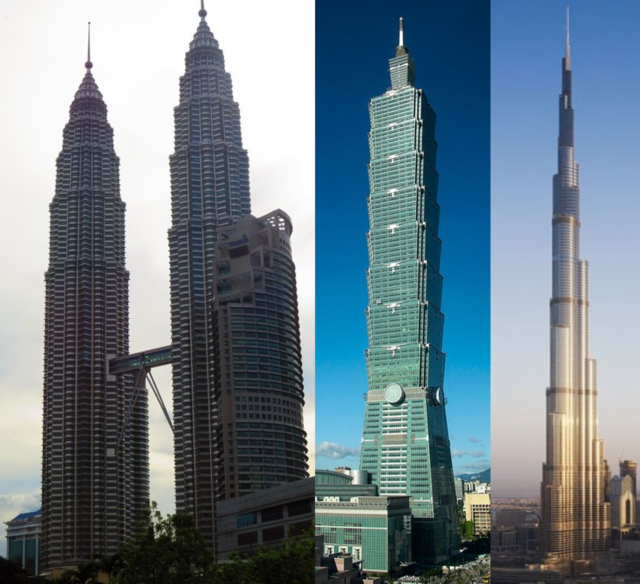 Skyscrapers, rather, emerge in rapidly growing countries. Not every rich country embraces skyscrapers—there are none in Norway or Denmark, for example—but again they are the exceptions. By and large, most rich countries find they have a need for them. Figure 2 shows the relationship between the number of 150-meter or taller buildings in 177 countries versus their respective GDPs (again in natural log format). Number of skyscrapers (150m+ buildings) versus gross domestic product (GDP) for 177 countries. Source: Skyscraper data is from the Skyscraper Center. 2016 GDP data from the World Bank. Note GDP is adjusted for purchasing power parity. The figure strongly suggests that there is a threshold, here about $34.5 billion, which, once passed, leads to more skyscrapers. 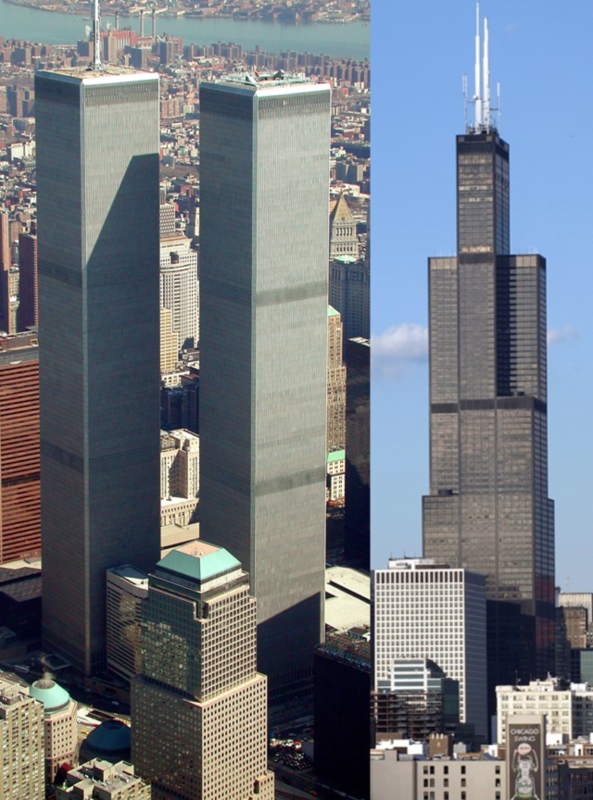 Once hit, there is very strong relationship between the size of an economy and the number of skyscrapers. In fact, on average, across countries, a 1% increase in a country’s GDP leads to a nearly 1% increase in number of skyscrapers. We can, in fact, zoom out one step further and look at this from a global perspective. Imagine that planet earth was one country. We can look at how the total number of skyscrapers completed on the planet each year is affected by global income growth. 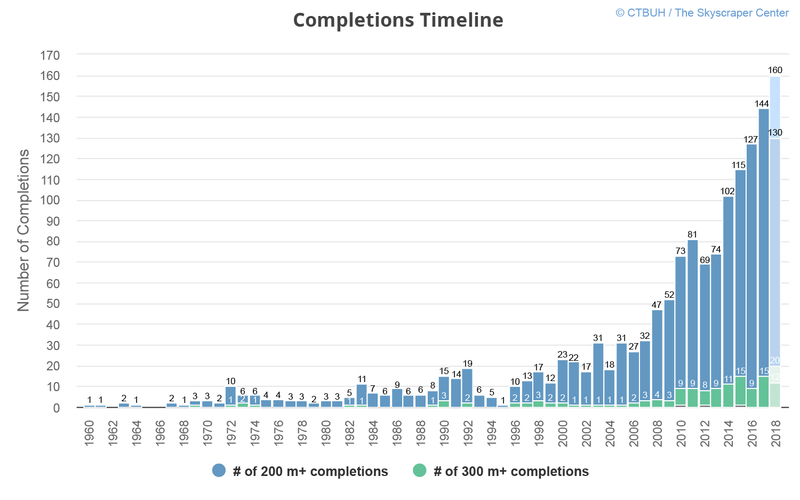 To this end, I collected data on the number of tall building completed each year since 1960 (where here a tall building is one that is 190 meters or taller), and three other important variables: global gross domestic product (GDP), global population, and the fraction of the human population that lives in urban areas. I have created detailed notes on the data sources and analysis for the interested reader. In short, global GDP, population growth, and urbanization can account for 92% of the variation in the number of skyscrapers completed each year. In other words, these three variables are the key to understanding why tall buildings are becoming both more numerous and taller. I find that, at the global level, a 1% increase in global economic growth leads to a more than 1% increase in skyscrapers, on average. In 1960, global GDP was $11 trillion; today it is $72 trillion. What’s more, since 1960, global GDP has only declined in one year (in 2009 after the Great Recession). This is worth stressing again: despite the ups and downs of national economies, such as that of the U.S. and those in Europe, planet earth, as a whole, has experienced a rise in incomes every year for the last 56 years, save one. Each year that the world increases its income means that it will continue to add more and more skyscrapers.